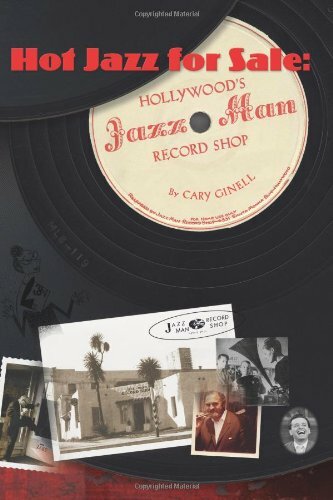 I read the book Hot Jazz For Sale: Hollywood's Jazz Man Record Shop by Cary Ginell and by page 8, I found myself googling an arcane possibility. 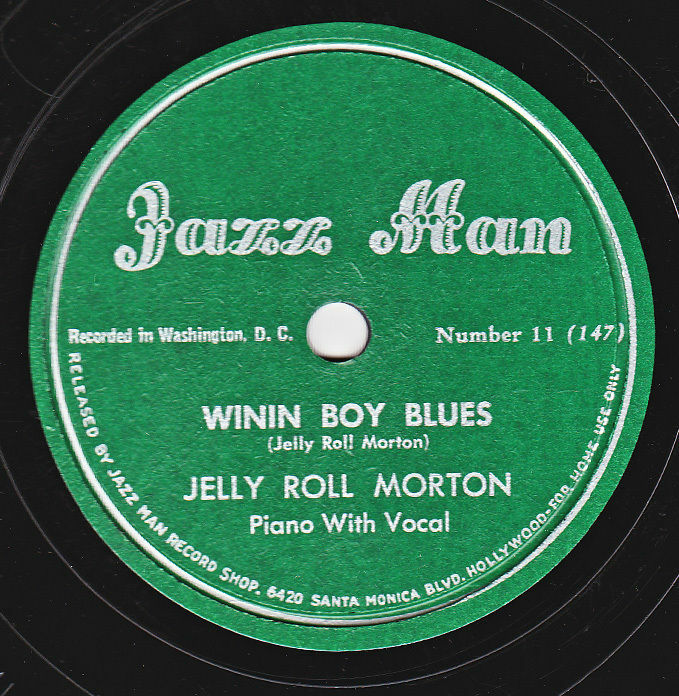 The founder of the Jazz Man record shop, Dave Stuart, had hosted a Los Angeles radio program featuring rare records from his private collection. 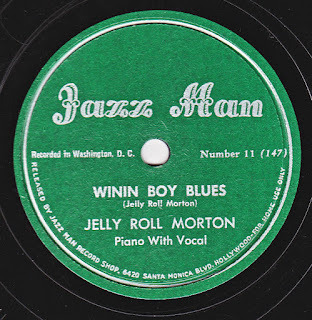 His shop and subsequent record label were actually named for his on-air name "The Jazz Man." Frustratingly, nowhere in the book does Ginell identify that radio station. I reached out to Mr. Ginell and he responded quickly "No, I could never find a listing for his program. Checked the radio listings in the LA Times, but nothing turned up." The store was founded in 1939 and it's first address was 8960 Sunset Blvd, West Hollywood, CA 90069, and the book tells me that at that time he lived in nearby Glendale, CA. The Jazz Information newsletter referred to his "daily broadcast" and also let the world know when the shop relocated to 1221 N. Vine street in 1940. Then in 1941 it moved to 6331 Santa Monica Blvd. Regardless of the moves, Stuart was rooted in LA. 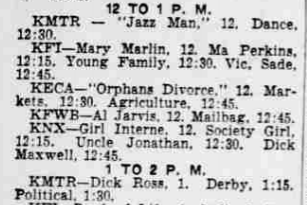 So the question becomes... how many radio stations might have been airing jazz daily in and around Hollywood in 1939? The answer is more than a few. But as you turn the clock back to cusp of 1940, the options thin out. Dave Stuart recorded some area jazz bands and their discographies bear a lot of call letters. 1940 the Dawn Club (operated by the Yerba Buena Jazz Band) opened near Union Square in San Francisco, at 20 Annie Street. Friday night broadcasts begin on radio KYA hosted by Hal MacIntyre. In 1942, the same band records five sides at at the studios of KFRC. Disc two of the complete Lu Watters' Yerba Buena Jazz Band Good Times Recordings are all recorded at KYA in August 1942... but those are all San Francisco call letters. They cannot be the home of the Jazz Man radio show. So who was airing jazz in LA? The DJ Alex 'Sleepy' Stein, worked at 1250 KFOX in LA, then he started 97.9 KNOB, reputedly the first all-jazz radio station in the world. But KLON didn't debut until 1950, and KNOB not until 1957. 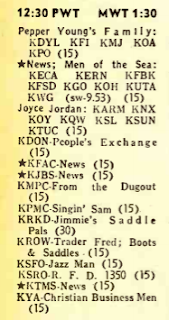 Options in 1940 included: 780 KECA-AM, 1360 KGER-AM, 1300 KFAC-AM, 1120 KFSG-AM, 1000 KFVD-AM, 640 KFI-AM, 950 KFWB-AM, 1200 KGFJ-AM, 570 KMTR-AM, 900 KHJ-AM, 1050 KNX-AM, and in nearby Beverly Hills 710 KMPC-AM. But we can whittle that down. KFSG was all religious talk and the big outlets like KFI, KNX and etc. weren't big on leasing time. Then I found a solid reference. [SOURCE] The San Bernadino County Sun lists the program on KMTR in issues from roughly December 22nd, 1939 through February 28th, 1940. Once I found a reference, I found it everywhere. The program even appears in Volume 11, issue number 33 of the Movie Radio Guide, published for the week of May 23-29 1942. But there is a problem, it's also on a different station... this time in San Francisco. In 1940 the transmitter and Blaw-Knox tower for 560 KSFO-AM was located on an 11-acre complex at Islais Creek on the Bay Shore. (This was also the site of the KWID shortwave transmitter in WWII) The station's studios were in the Palace Hotel at 2 New Montgomery St. in downtown San Francisco. Clearly this must be an unrelated program. But here's the weird thing, it aired at the same time of day as the KMTR program. That mystery, I have not solved.